Midfielder Sam Walker believes interim manager Jim Harvey’s back-to-basics approach is paying dividends with The Shaymen. Halifax are still unbeaten under Harvey, having beaten Gateshead and Dover and drawn with Guiseley - the first time they’ve gone three consecutive games without defeat this season. The draw against Guiseley was thanks to Walker’s late free-kick, his third against The Lions this season, and he believes Harvey is getting a response from the squad. “As a manager he demands everything and he sets very high standards” Walker said. “If you’re not meeting them you’re going to know about it. “He’s done a lot of work defensively, not just with the back four but collectively. “Everyone from back to front has been working on that. “Organisation has been key to the last three results. “We’ve stripped it right down, we’ve said ‘let’s keep it simple’ and it’s worked for us. “I think you can see from the results that he’s got a response. Walker admits the new-look Town squad took a while to acclimatise to each other this summer, but says the squad are confident about beating the drop. “You’re bringing players in who have played against each other so there’s a bit of familiarity but there’s other players coming in that people don’t know a lot about,” he said. “In pre-season it’s very much thinking about getting yourself right, getting fit, and then before you know it the season’s upon you. “I didn’t think we gelled as much as we wanted to. “I don’t know what it is, I can’t put my finger on it, but it just seems like it’s all coming together a bit better. The ex-Curzon skipper is cautiously optimistic about their prospects and insists the mood is positive. “It’s really good, it’s lifted,” he said. “In all fairness, the mood has been pretty upbeat to say we’ve took some hard defeats this season. “I think that’s credit to the mental strength of the boys, but it’s a nice place to be at the minute to be three unbeaten. “We’ve been scoring and conceding less so everything’s moving in the right direction. “I’ve made the mistake of saying we’ve turned a corner before but that was after one or two games. 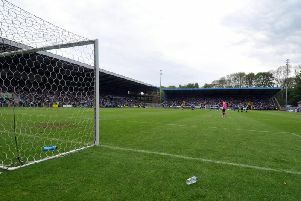 Two of Walker’s three goals against Guiseley have been free-kicks, with his other set-piece coming in the 2-2 draw in the FA Cup at the Shay in October. On his goal last Saturday, Walker said: “It got a deflection but I’m definitely taking that, it looked like it was on target anyway - we won’t let that spoil it. “That’s three in three against Guiseley now. I wish I could play them every week! “I practice free-kicks in training but it’s always been in my game. Walker has started just eight games so far this season, and admits a sense of discontent when summing up his campaign to date. “Frustrating, very up and down,” he reflected. “You’ve just got to keep going, keep trying to do something that’s going to get you a start. “It’s never going to be easy but nothing worthwhile is, so you just have to keep plugging away. “I felt I was given a fair chance under Darren Kelly, I thought he gave me a run of games and I scored a couple of goals in that. Walker could have joined headline-grabbers Salford City during the summer on a more lucrative deal, but insists he has no regrets in opting for Halifax instead. “In hindsight anyone could say that after the run they’ve been on, getting on BBC Two on two Friday’s,” he said. “But no, I’m happy here. There’s a good group of lads here and I feel really settled. “I’m not the only one in that boat, although it’s taken a while for everyone to settle down and work each other out. Walker says the league remains the priority for Town, but that a run in the FA Trophy, starting at home to Tamworth tomorrow, would be welcome. “You just want to carry on doing what you’ve been doing in the last three weeks,” he said. “Now we’re looking to Saturday and the FA Trophy. “Tamworth are going to come here and give us a really good game so it’s all our minds focused on that now. “If we get a cup run, we’ll take it, but obviously the league is our bread and butter.